We are back in France after a week in London to launch my new book Healthy Eating for Life. 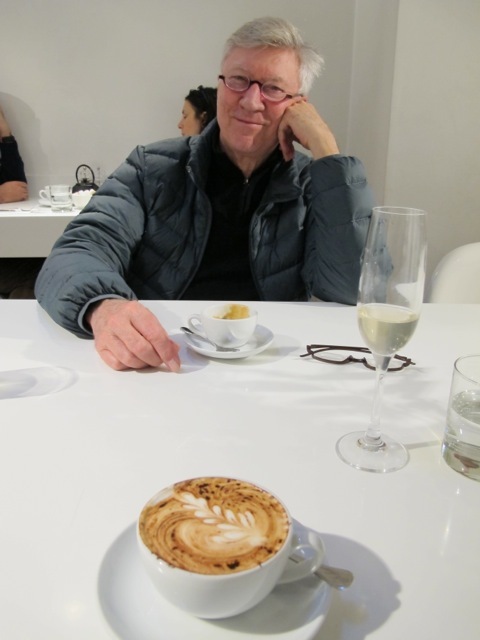 Friends from N-S-E & W–some we hadn’t seen for years–came to Blenheim Crescent in Notting Hill on a rainy night last Thursday and were bemused and happy to meet others they themselves hadn’t seen for ages. The publishing team from Constable and Robinson were out in force; marshaled by my editor Judith Mitchell they sailed round with plates of nibbles–cooked by resident cook Clara Grace Paul from recipes in my book. It became more than just a launch party–it was a reunion. In fact it was a blast! Even the bookshop seriously underestimating the number of books they’d need in place–(they sold out just over half way through)–didn’t dampen the spirits! Magician Meredith, the mistress of ceremonies, had surpassed herself–the book was on its way! Next day I decided to give us/me a treat. 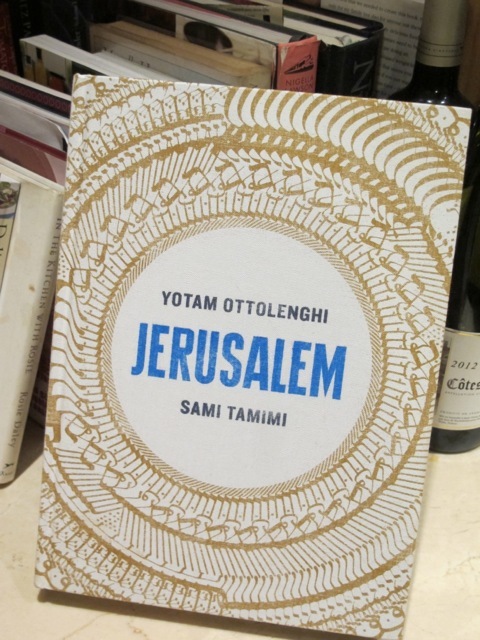 I bought Yotam Ottolenghi and Sami Tamimi’s newish cookbook. These two cooks, born on opposite sides in the divided city (one Israeli, the other Palestinian), met in London and have created a revolution in dining and eating. Their food manages to be sumptuous and simple at the same time–and eminently cookable at home. 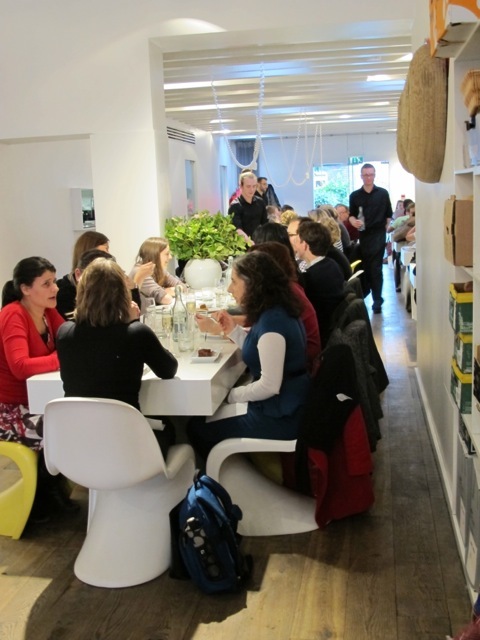 On Saturday the treat was extended to lunch at their small restaurant in Islington. Forty minutes in our case–but we didn’t mind. We passed the time staring at the heaving counter of prepared salads, trying to make up our minds what to eat–a mouth watering, morale-boosting exercise! We’d made our choices–here are mine–and settled down to enjoy our treats. 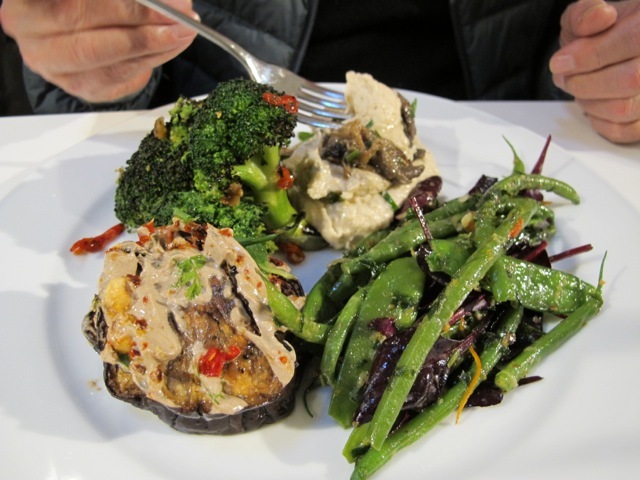 top left to right: char-grilled broccoli with chili, butter bean hummus with caramalised red onions, green beans and mangetout with red salad leaves, grilled aubergine rounds topped with tahini! one happy punter sits opposite another! Very magnanimous of Robin to endorse another’s cookbook/restaurant but proof that he is confident of his own success. I will probably buy both books now! When next in sunny London, will certainly visit said restaurant. Thank you! The look on your face says it all, Robin. …glad to hear that you are enjoying yourself! Out of the frying pan into the butterfish, Marj–bon appetit! Good job, Robin! At first it was just an idea, followed by a blog, then your first book reached number one on Amazon and now an entire storefront is decorated with your new book. What a second career! During our visit to London last August, we spent some days in a hotel in Upper Street, Islington. Nice area with many varied restaurants where you can eat outside. 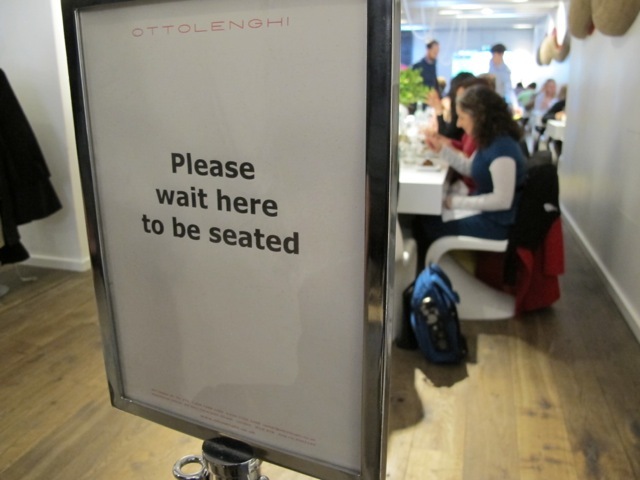 Too bad Ottolenghi we have not seen. Recently I read an interesting article about him in a German magazine. I cut out a 10 minute recipe for a Pilaw. Congratulations on this second cookbook I received my copy from amazon UK on Monday and am enjoying it already. Its interesting to hear you were not exactly easy about finding you had diabetes. I have had an impression you just eased right into it and had been eating correctly all your years even before the diagnosis. Most people are shocked and scared and in denial at first. You are a great asset to the diabetes community for your notoriety as a famous actor and your knowledge of the disease. Your coking is so natural and tasty hat anyone can do it. My Dad had type II and got it late in life and died due to complications. I have a 50/50 chance of getting it because of that and yet the 2 things I can do is keep my weight down and keep exercising (both of which I struggle with) Thank you for these wonderful recipes to help me with the first goal. Sounds, and looks, very enjoyable! 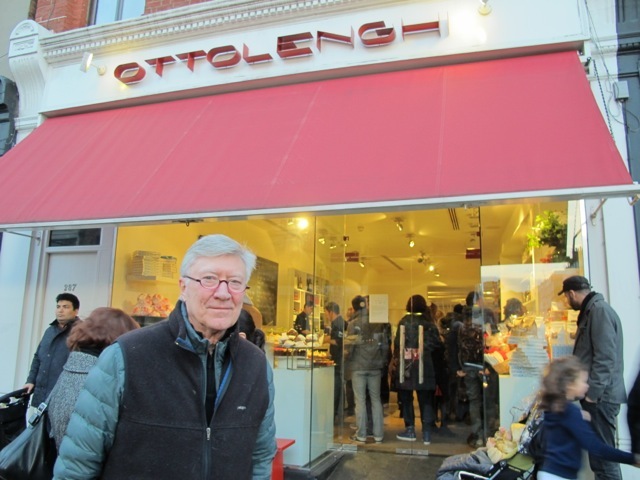 What a lovely story regarding your book signing in London! Hats off to Maredith for thinking on her feet! I am so looking forward to the arrival of my copy of Healthy Eating for Life. Being that I just recently revisited the Poldark series through Acorn Media, “The Complete Collection” on DVD, and found myself awakened in 18th century Cornwall, I decided to look on the web to see about the cast, and where they are now. I found that you are having a cooking workshop, 2014, and jokingly said to my husband, we will be going to France in May. He laughed, but he knew in my heart that I am a dreamer, and, at least, a hopeful one (we live in California, USA)! 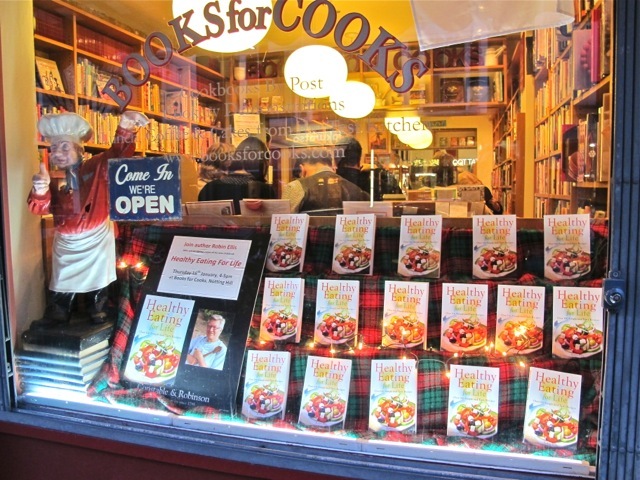 Then I found that you were having a book signing for Healthy Eating for Life in London, January 16, and that Books for Cooks would graciously accommodate those of us who could not be there, and that you were kind enough to sign even more books! So, I reserved my copy through Eric and followed-up with Maryanne by phone on the very day of the signing! I first noticed you had written Delicious Dishes for Diabetics and knew then that your cookbook must be health conscious. You see, when I was a little girl, my younger brother of 9 yrs old was diagnosed with Type 1 Diabetes, severe juvenile diabetes. Needless to say, our holiday treats stopped, and my mother’s cooking changed to accommodate his disease. He died when I was 16, five years after his diagnoses. I buy strictly organic fruits, vegetables, and meats and am not a big fan of sweets. I am a bland cook, and want to eat healthy with flavor, and zest. I will be turning 60 next month, and enjoy staying thin and healthy….So thank-you, Robin, for helping me start off my next decade with new and exciting cooking experiences! Definitely a delightful treat for me…and my husband! Thanks Anne for your kind words. I was very sorry to hear about the death of your brother. Understanding and treatment have improved over the years but that is small compensation. I hope you enjoy the second book. Also, I’m doing a book tour in the States that will take me to LA and SF. Will be in LA on March 15th with an booksigning event at Chevalier’s Bookstore on Larchmont (http://chevaliersbooks.blogspot.fr/) in the afternoon–probably 3pm-4pm. Not sure of the San Francisco venue or date yet–hoping to do a food demo Whole Foods in Palo Alto March 18th or 19th. So very kind of you Robin, thank-you. Yes, being diagnosed with Type 1 Juvenile Diabetes in the mid-1960s proved to be quite devastating for my young brother, and changed our family dynamic. And, yes, I am so looking forward to the enjoyment and pleasurable experiences I will have cooking with your new book when it arrives! Also, I live near Palo Alto in Castro Valley, CA and would hope that the food demo at Whole Foods in March is something that you can do! LA is a 6 hr. drive, Palo Alto, 30 minutes! Please keep blogs coming regarding your planned California project(s)! We’ll keep you up to speed on that, Anne. Well, now there was in London a book launch like no other. A sellout due to a lot of thought, effort and zeal put into it. A huge success judging by author’s smile. My most sincere congratulations to you, Robin and to you, Meredith. May you both continue on your well chosen path.. Thanks Odette, for your good wishes. We did have fun and it was good to meet up again with many old friends. I now have to get back on “the chosen path”! I’m feeling good, Shirley and relieved the book is launched! Ah…I tried so hard to be there but circumstances confounded me! Maybe book no 3?? Still, 2 copies purchased and, with or without signature, it’s a great read! As an aside, I am lucky to be able to count Yotam as a personal friend & I can tell you that he is as lovely, easygoing & friendly in ‘real life’! And his cooking, always, is amazing. It comes as no surprise that you both enjoy his restaurants & books. Definitely simpatico, I would guess! 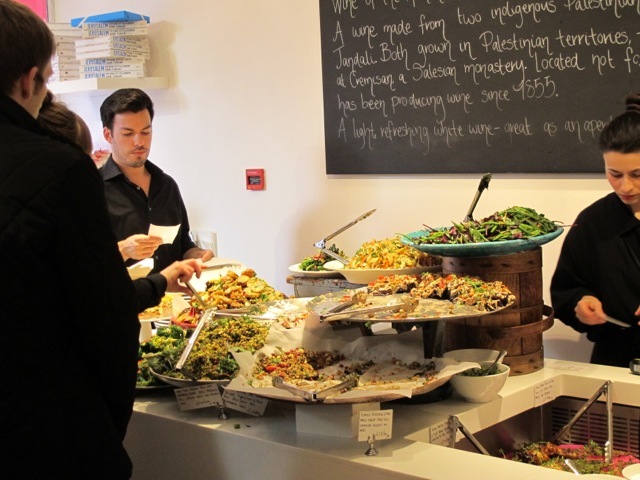 Next time you are in London, you should lunch at Honey & Co…Itamar & Sarit are ex-Ottolenghi employees and their small but perfect cafe/restaurant is a revelation if you love those middle eastern flavours, as I know you do. Anyway, many congratulations on another wonderful addition to the cookbook world! WOW!–just cooked a roast cauliflower dish from JERUSALEM! The Islington joint is so pleasing to be in. The staff are universally pleasant while retaining their individuality. It is a character-full place. That comes from the top and is a surprise these days and makes a visit so much more enjoyable. We will try Honey and Co for sure next time and recommend others to try it too. Thanks Rachel for your very kind comments. Its a very snowy day here on Long Island today and I just finished putting the last of the Christmas decorations away! It always seems a little bittersweet when its all finally packed away so what better way to perk up with a log on and read as to whats happening with you and your world. Low and behold, you have been so busy. I knew your visiit to London for your book signing was successful but to see the second post with some of you and your wife Merediths adventures sounded and looked amazing. You have such intergrity with show casing anothers cookbook and the amazing meal you had at both authors restaurant. You looked so content. I knew I would be to had I just ate a delisious meal as you just had. So cute. Well nice touching base take care and stay well. Thanks Georgene for those kind words. Delighted your book signing was a success. The salad looks amazing! Congrats on the success of your cook book. The salad looks delicious. Hello Meredith and Robin so glad that your book launch went so well, apologies for not being in touch before now, but on the 29th November we had a fire in the back bedroom the lap top computer battery went bang. The room was gutted but we got out ok. So sorry to read about your lovely cat .There will be a new star in the sky now. Elaine–relieved to hear you both survived the fire. I loved reading the fireman’s reaction to seeing your priorities as far as what to save!Welcome back and hope the new computer gets into shape quickly. Thanks Randy–Sharon and Joel are lucky to live close enough to make it a regular place.It is so reasonable and pleasant and always packed. The West End restaurant–NOPI (North Of Piccadilly!) is great too but much more pricey.